1937 Sun Bowl Carnival Football program Hardin Simmons vs Texas Mines. Nm: clean front and back; nice spine. I wrote "The Collectors Guide to Sports Illustrated and Sports Publications" Phil Regli (Beckett) and have been in the sports hobby for 40 years. If you have a question regarding your collection - please drop me a note. I update this every week with new material from my warehouse of 200,000 items. Please let me know what you collect and I will put that into the store. Grading: NM- is near mint, - means really clean copy with nice spine, surface - no creases, bends or breaks. EM - is exmt - means it is a clean copy but will have a flaw like a small crease, bends or spine breaks. However it is in nice shape. Ex - will have a significant flaw. Vg- rather flawed; gd - really flawed. 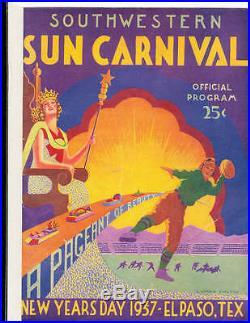 The item "1937 Sun Bowl Carnival Football program Hardin Simmons vs Texas Mines" is in sale since Thursday, September 8, 2016. This item is in the category "Sports Mem, Cards & Fan Shop\Sports Trading Cards\Baseball Cards". The seller is "wwwprpsportscom" and is located in Round Rock, TX. This item can be shipped to United States.